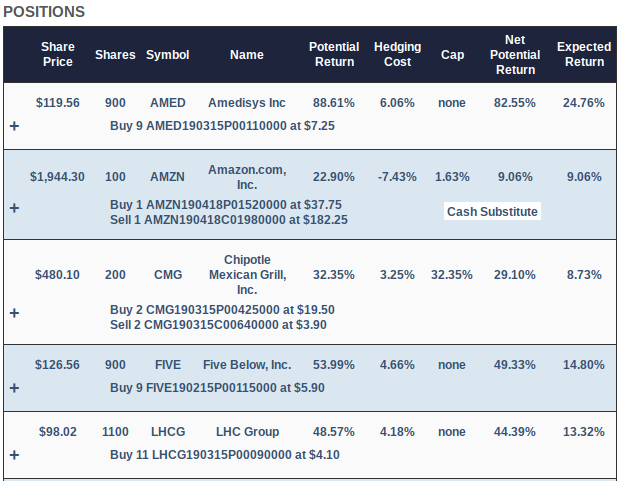 It has been six months since I presented five hedged portfolios and 10 top names in week 69 of my Marketplace service (September 20). Here's how everything did. 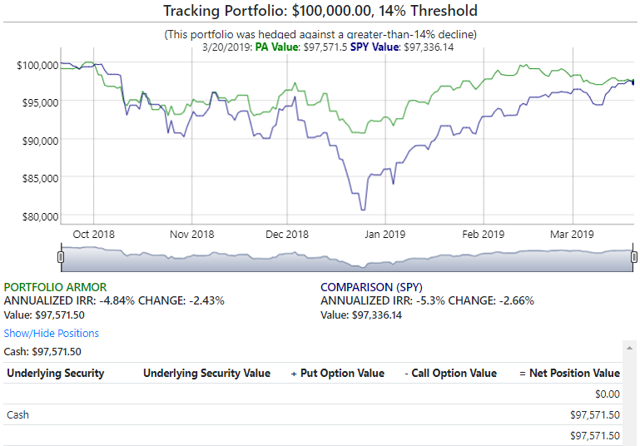 All five hedged portfolios outperformed SPY, but none outperformed its expected return. The top 10 names (unhedged) outperformed SPY. 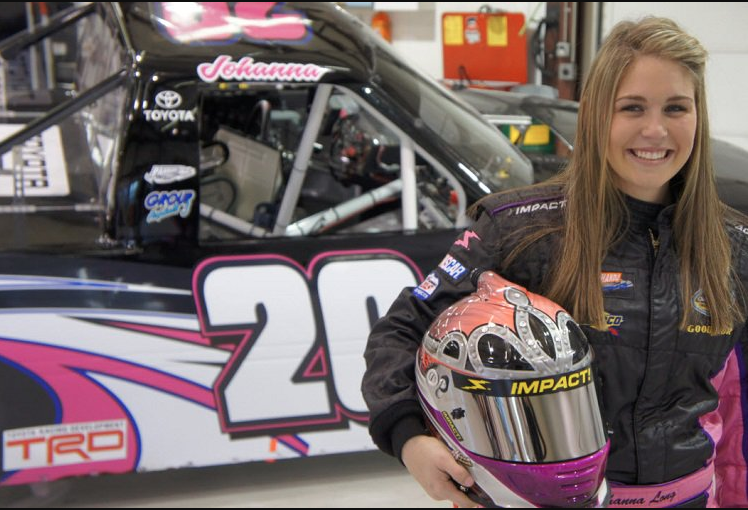 So far, their record vs. SPY is 42-25-1. 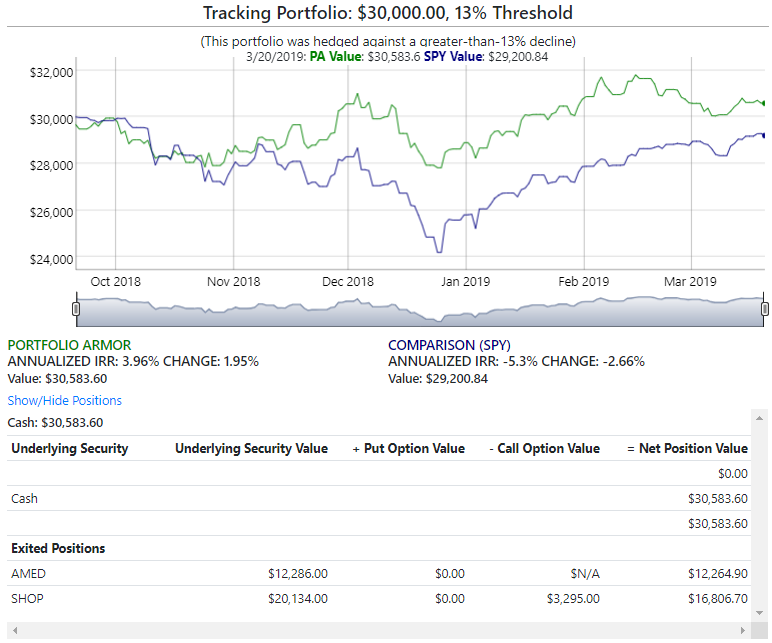 Each week, since the beginning of June 2017, I have presented at least two hedged portfolios created by Portfolio Armor to my Bulletproof Investing subscribers. This is an "investing with a helmet on" approach, and these portfolios are designed to last 6 months at most. As with any investment method, the returns with this approach will vary. But in the interests of transparency and accountability, I have promised to publicly share the final performance of everything I present, regardless of how it does. 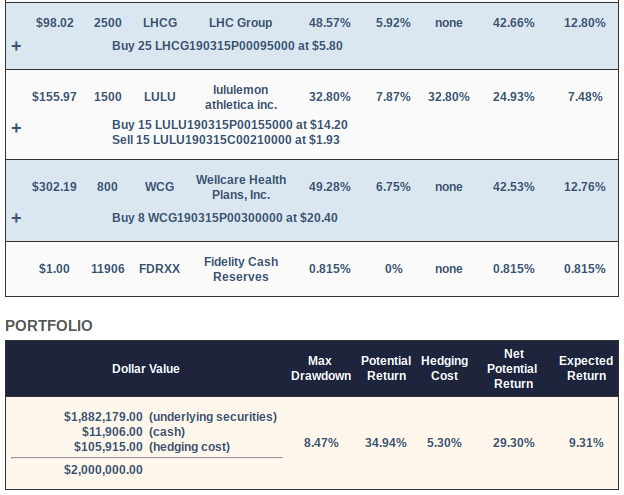 Here, I update the final performance of the five hedged portfolios and the top 10 names (unhedged) that I presented in the 69th week I offered my service. Let's look at what I presented in week 69 and how it did. This was the $30,000 portfolio. The primary security here was Amedisys (AMED). 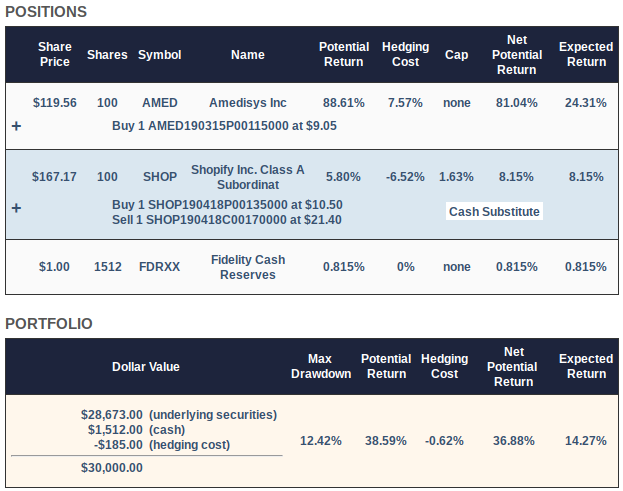 It was selected because it had the highest potential return estimate, net of hedging costs, when hedging against a >13% decline, and it had a share price low enough that you could buy a round lot of it for less than $20,000. Shopify (SHOP) was added in a fine-tuning step to absorb leftover cash from rounding down to round lots of the first two names. The image above was generated by Portfolio Armor on September 20 and presented in this Marketplace post at the time. 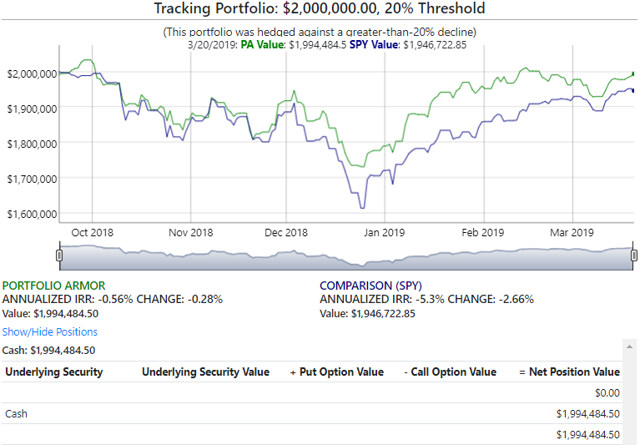 The worst-case scenario for this portfolio was a decline of 12.42% (the "max drawdown") and the best-case scenario was a gain of 36.88% (the "Net Potential Return" or aggregate potential return net of hedging cost). The "Expected Return" of 14.27% was a ballpark estimate taking into account that actual returns, historically, have averaged 0.3x Portfolio Armor's potential return estimates. Here's how the portfolio did, net of hedging and trading costs. 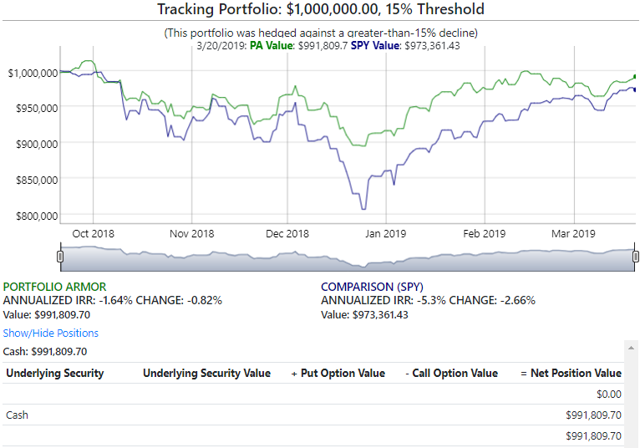 This portfolio was up 1.95%, underperforming its expected return but outperforming SPDR S&P 500 Trust ETF (SPY). So far, we have 6-month performance data for 17 portfolios I've presented hedged against >13% declines. Here's how all of them have done (click on a starting date to go to an interactive version of that chart). This was the $100k portfolio. 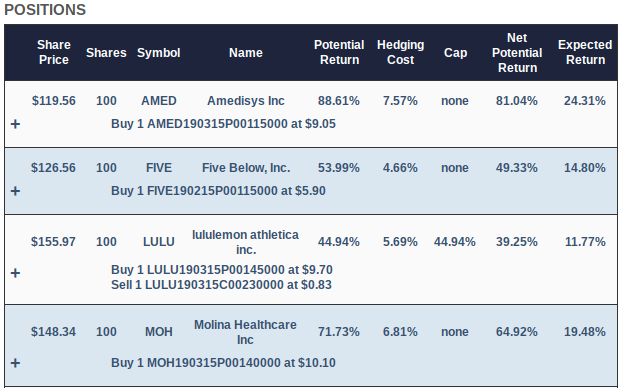 This one included AMED, Five Below (FIVE), Lululemon Athletica (LULU), and Molina Healthcare (MOH) as primary securities. SHOP was added in the fine-tuning step again to absorb cash left over from the process of rounding down to round lots of the primary securities. The worst-case scenario for this one was a decline of 12.39%, the best-case scenario was a gain of 34.49%, and the ballpark estimate of an expected return was 12.31%. This one was down 2.43%. 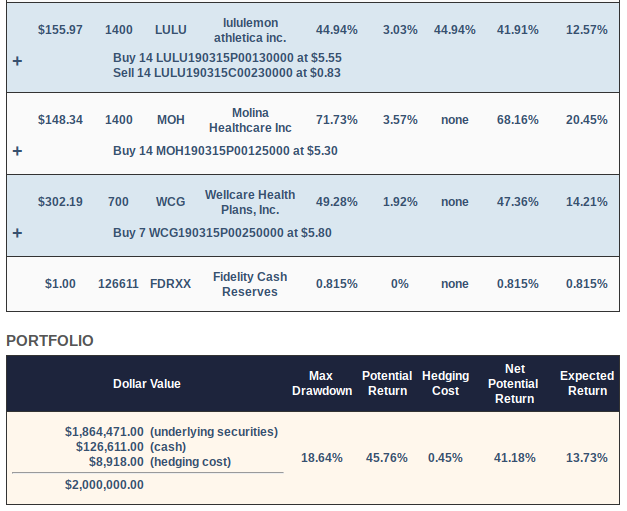 So far, we have 6-month performance data for 24 portfolios I've presented hedged against >14% declines. Here's how all of them have done (click on a starting date to go to an interactive version of that chart). This was the $1 million portfolio. 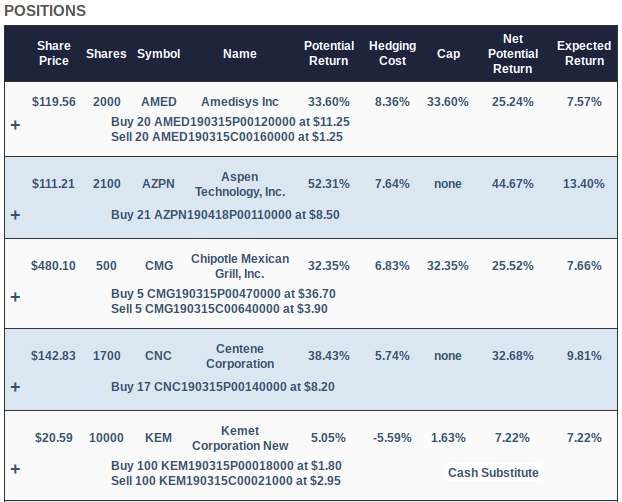 It included AMED, Chipotle (CMG), FIVE, LHC Group (LHCG), LULU, MOH, and WellCare Health Plans (WCG) as primary positions. Amazon (AMZN) was added to absorb the leftover cash from the process of rounding down the primary positions to round lots. 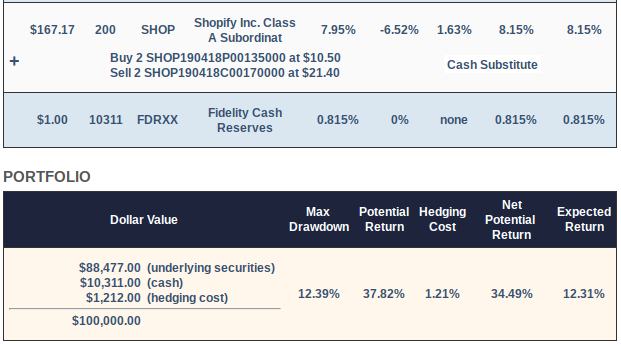 The worst-case scenario here was a drawdown of 13.85%, the best-case scenario was a gain of 39.36% (the net potential return), and the expected return was 13.07%. This one was down 0.82%. So far, we have 6-month performance data for 41 portfolios I've presented hedged against >15% declines. Here's how all of them have done (click on a starting date to go to an interactive version of that chart). This was the $2 million aggressive portfolio. This one included AMED, CMG, FIVE, LHCG, LULU, MOH, and WCG. AMZN was added to absorb leftover cash in the fine-tuning step. The worst-case scenario here was the max drawdown of 18.64%, the best-case scenario was the net potential return of 41.18%, and the expected return was 13.73%. This one was down 0.28%. So far, we have 6-month performance data for 52 portfolios I've presented hedged against >20% declines. Here's how all of them have done (click on a starting date to go to an interactive version of that chart). This was the $2 million top names portfolio. 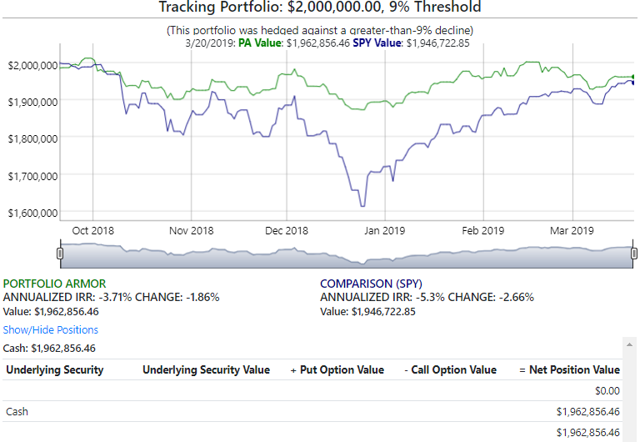 Names that appeared in this portfolio but didn't appear in the previous September 20 portfolios were Aspen Technology (AZPN), Centene (CNC), and Kemet (KEM). The worst-case scenario was a drawdown of 8.47%, the best-case scenario was a gain of 29.3% and the expected return was 9.31%. This portfolio was down 1.86%. 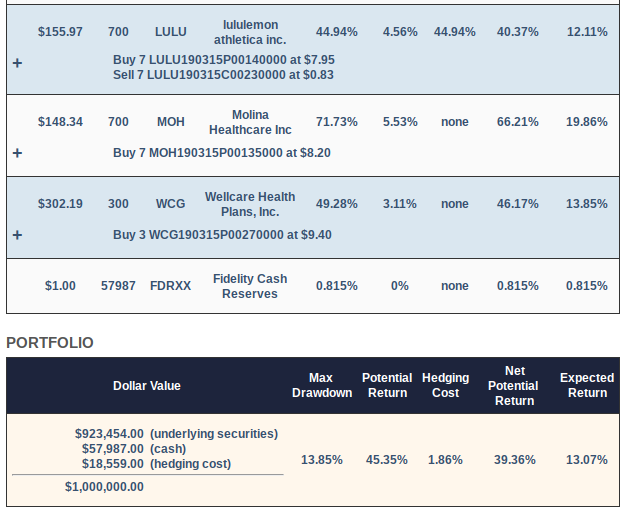 So far, we have full 6-month performance for 69 portfolios I've presented hedged against >9% declines. Here's how each of them did (click on a starting date to go to an interactive version of that chart). One note about the table above: It includes both $100k portfolios and $1M portfolios. 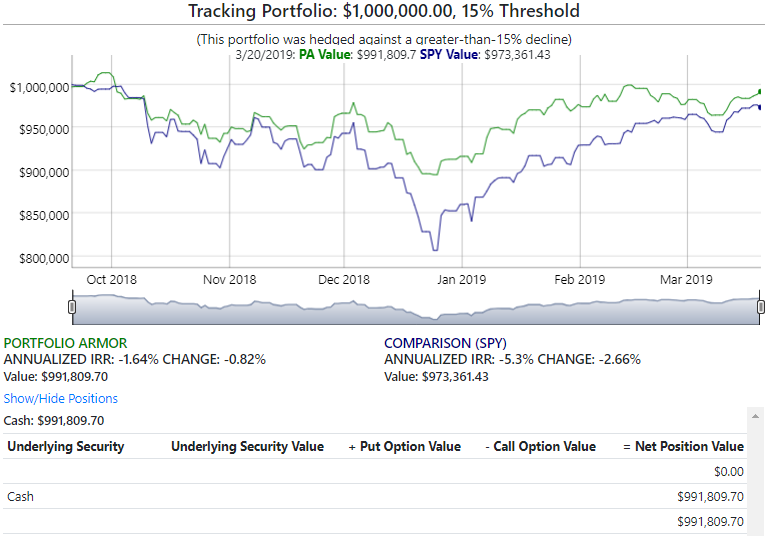 Starting with the May 24 cohort, I began presenting $100k portfolios hedged against >14% declines, so they appear in a different table from that point forward. 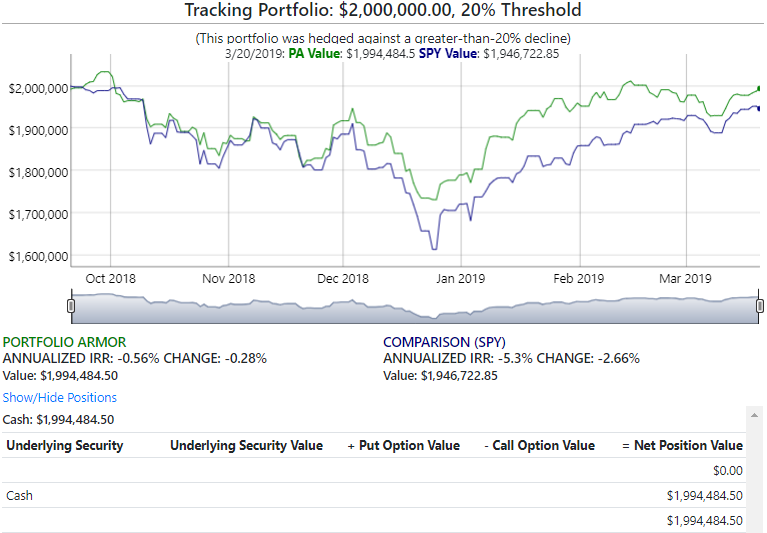 My guess is that will slightly improve the average performance of the portfolios hedged against >9% declines. 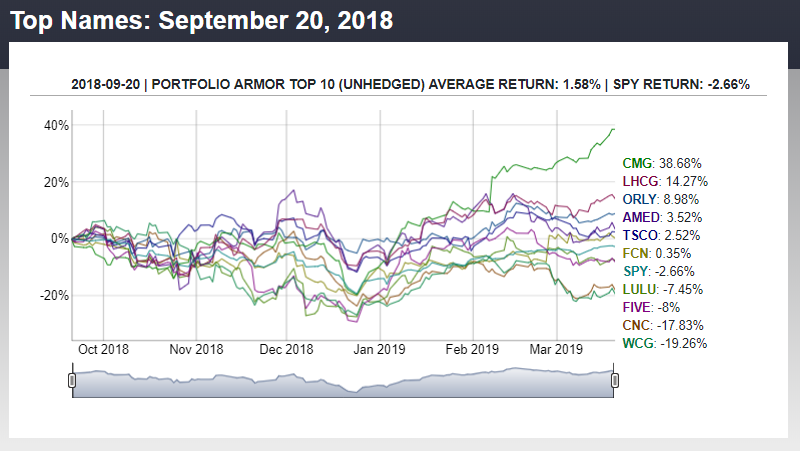 These were Portfolio Armor's top 10 names as of September 20. Names that didn't appear in the portfolios above were Tractor Supply (TSCO), FTI Consulting (FCN), and O'Reilly Automotive (ORLY). The image above was generated by Portfolio Armor on September 20 and was included in the same Marketplace post as the top names portfolio above. Here's how the top names did. The top names (unhedged) were up 1.58% on average vs. down 2.66% for SPY. 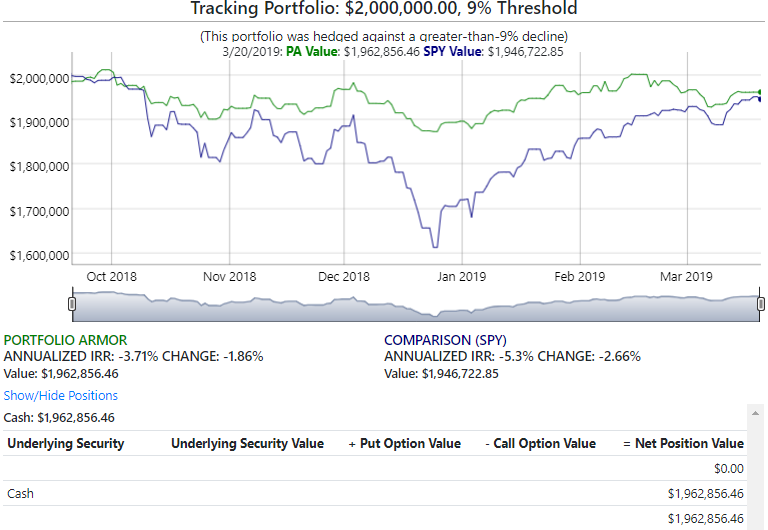 So far, 42 top names cohorts have beaten SPY, one has tied SPY, and 25 have underperformed SPY over the next 6 months. You can see the performance for all of the top names cohorts I've presented so far in the table below (click on a starting date to go to an interactive version of that chart). 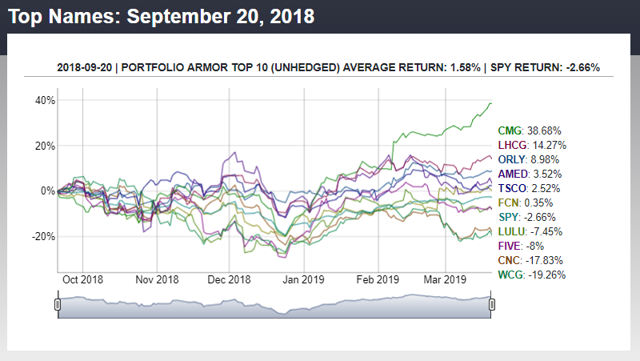 So Portfolio Armor's top 10 names averaged 7.22% over the average of these 67 6-month periods, versus SPY's average of 4.42%, an average outperformance of 2.80% over 6 months. For a few months, in addition to posting those top names in my Seeking Alpha Marketplace service, I also time-stamped them on Twitter. If you click on the tweet shown below and scroll down, it will take you to a thread showing those time-stamped posts as well as charts of their subsequent performance. 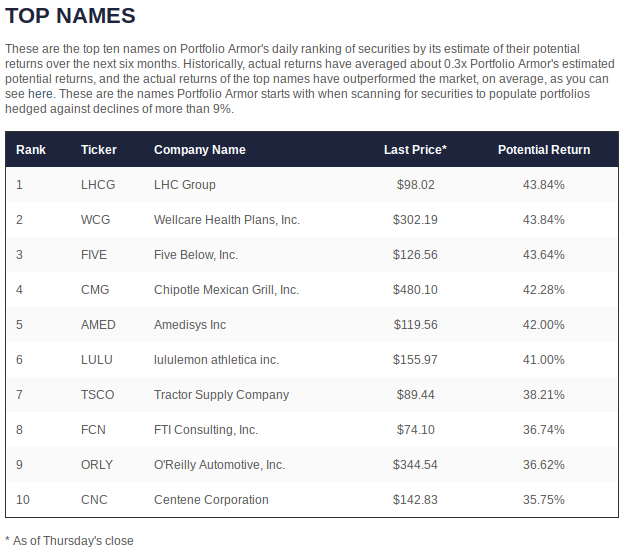 The top 10 names (unhedged) outperformed SPY for the 42nd time out of 68 weeks (we didn't post the top 10 in week 1). None of the hedged portfolios this week outperformed their expected returns, but all outperformed SPY. We still suggest investors consider splitting their assets into two or three tranches, if possible, and investing in one hedged portfolio now, one in a month or two, and so on. That way, you'll have four to six entries per year (since each hedged portfolio lasts 6 months), reducing the amount of money that would be exposed to a significant market transition.